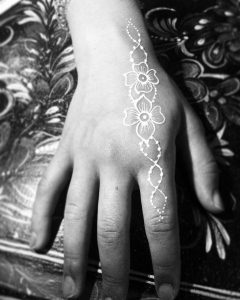 White Henna is a striking difference to natural henna. It looks very beautiful. 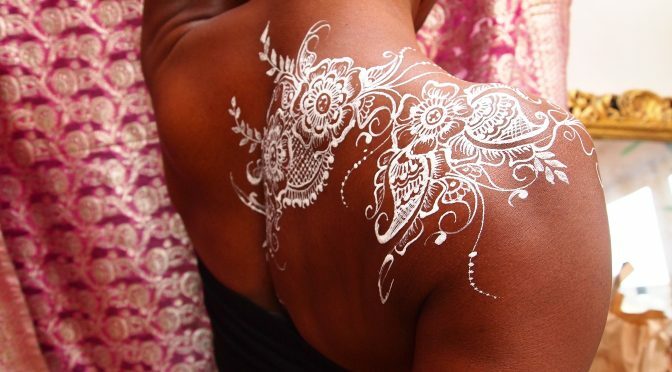 Unlike henna, White Henna dries in about 2-3 minutes. White Henna is a completely different skin safe product which sits upon the skin rather than stains. The artwork will last a few days and is easily removable. Perfect for parties, and it happens to glow under UV which is an extra bonus. If you are thinking of having White Henna for your wedding, we would advise you to have it applied on the morning of the big day to keep it perfect for as long as possible.